ENSENADA, Baja California, Mexico —Spotlighted with an in-depth microscopic look at the first 25 years of the marquee SCORE Trophy Truck racing division, Vol. 4, No. 7 of the acclaimed SCORE Journal digital magazine is now online. While celebrating 25 years of SCORE Trophy Truck launched by Sal Fish in 1994, this issue also includes several additional feature stories saluting new SCORE sponsor VP Racing Fuels Inc, the annual Off-Road Tire guide, and an early preview on September’s Lucerna Hotels and Resorts Tijuana 22nd SCORE Desert Challenge as well as SCORE News and another unique industry update. At the top of the list is the microscopic look at the ‘Monsters of the Desert’ SCORE Trophy Trucks featuring Off-Road Motorsports Hall of Famer Rob MacCachren as he was crowned the first SCORE Trophy Truck season point champion in 1994 and this year this legend of the desert has already won the first two SCORE Trophy Truck races of the year to give him a SCORE-high of 17 SCORE Trophy Truck career race wins. Vol. 4, No. 7 of the SCORE Journal is once again filled with numerous interesting worth-reading features, stories, exciting videos and several news items. This edition is anchored around an extensive report on the first 25 years of the marquee SCORE Trophy Truck racing division. The monsters of the desert ran as their own series in conjunction with SCORE events for the first four years of the class. It was called the Tecate SCORE Trophy Truck Series in 1994, 1995, 1996 and 1997. 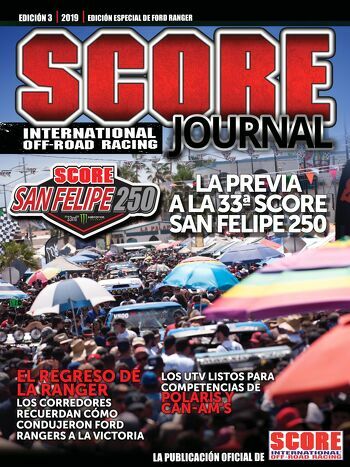 In the SCORE News section, the major story is on the sponsorship SCORE has signed with the Lucerna Hotels & Resorts that makes the hospitality company the official hotel of SCORE and the title sponsor of this year’s Lucerna Hotels & Resorts Tijuana 22nd SCORE Desert Challenge in September. Among the other special reports in this issue is a special announcement of the six new inductees into the Off-Road, including four racers with lengthy resumes in SCORE racing. The new competitors in the Class of 2018 are Mark McMillin, Johnny Campbell, Cameron Steele and Robbie Pierce. While Pierce still races with SCORE he was inducted in the Pioneer-Industry category as former owner of MasterCraft and Impact and current owner of Jimco Racing Products. The other two 2018 inductees will be Ed Robinson, the founder of the VORRA racing series in the Special Achievement and Jim Brmham who is being inducted in the Pioneer-Advocate category. All six will be honored during the annual ORMHOF Induction awards night dinner on Monday, Oct. 29 at the South Point Hotel & Casino in Las Vegas. 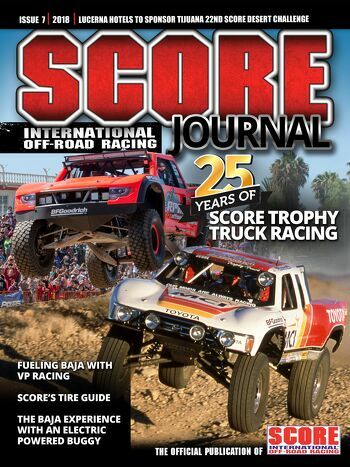 Also spotlighted in the issue is an in-depth look into VP Racing Fuels’ sponsorship with SCORE. The Off-Road Marketplace in this issue continues to shine brightly on the latest off-road products for 2018 for racers and enthusiasts. Featured this month is the 2018 SCORE Journal annual tire guide for the serious enthusiast.